Although research has shown automated external defibrillators (AEDs) can increase survival after cardiac arrest, only 17 of 50 U.S. states required at least some of their schools install AEDs as of February 2016, according to a database analysis. Among those 17 states, only five offer full funding to schools for purchasing AEDs. In 2010, nine states required AEDs in schools. Lead researcher Mark V. Sherrid, MD, of the hypertrophic cardiomyopathy program at New York University Langone Medical Center, and colleagues published their results online in the Journal of the American College of Cardiology on March 27. The researchers noted that sudden cardiac death was the leading cause of death in the U.S., including for school- and college-aged individuals. One study found the incidence of sudden cardiac arrest was 3.7 of 100,000 patient-years for children and 6.3 of 100,000 patient-years for adolescents. The American Heart Association recommends the placement of AEDs in locations with high population density, including airplanes, airports, shopping malls and large apartment complexes, according to the researchers. They cited research from the Resuscitation Outcomes Consortium that found the survival rate of sudden cardiac arrests was between 6.7 percent and 10.2 percent, whereas the survival rate among students in schools with AED programs who had shockable rhythms ranged from 64 percent to 72 percent. For this analysis, the researchers examined the LexisNexis Academic database and searched for current state statutes and regulations. 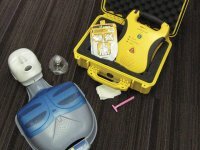 Of the 17 states that required AEDs, one required them in public grade schools, private schools and colleges; four required them in public grade schools and colleges; two required them in public and private grade schools; nine required them in public grade schools; and one required them in colleges. In addition, three of the 17 states required AEDs only in schools that participated in interscholastic athletic programs. Based on the researchers’ calculations, 25 percent of U.S. schools are in states that require AED installation in any school, including 29 percent of public schools and 13 percent of private schools. They estimated that nearly 35 million public school students attend schools in states that do not require AEDs in schools. In addition, only five of the 17 states that require AEDs in schools reimburse or pay for the AEDs. Four states provide for funding contingent on periodic appropriation by the legislature, four require the local board of education to provide AEDs and the remaining four require AEDs but do not pay for them. The researchers mentioned a few limitations of the study, including that state statutes could have changed since February 2016, which they used as a cut-off date. They also noted that some legislation might not have been enacted into statute.